After much deliberation I have chosen architecture as the theme for my series. When I travel close to home and further afield, I enjoy looking at buildings and photographing architectural details such as ornamentation, ironwork, floor patterns, stained glass windows and repetitive architectural elements. I have been fortunate enough to take architectural tours in several cities to better understand the styles used in that place. I enjoy both modern and classical architecture, and learn from the way architects have used the principles of design in their structures. Looking back over my work, I have enjoyed working with architectural elements, whether it was interpreting designs from the Great Synagogue in Budapest to create a patchwork box for my City and Guilds course, or reproducing elements of a barn for studies. 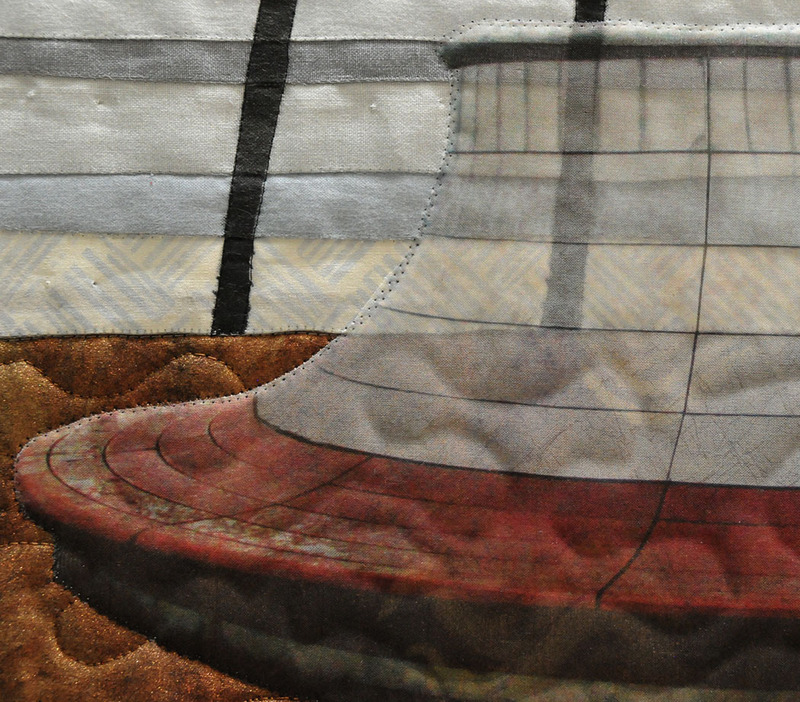 Working with architectural elements also provides the opportunity to experiment with different techniques, while creating thematically linked quilts. The first piece in the series is one that I created for the architecture with stenciling challenge, Das Riechstag. The dome captured my attention because of the repeated windows set against a grey rainy sky. The building which was completed in 1894 included a glass and steel dome. Following a fire in 1833, the building fell into disuse, and the original dome was demolished in 1954. After World War II the West German parliament met in Bonn. Following reunification, the Bundestag (German Parliament) returned to Berlin. The Reichstag building required major renovations and modernization. British architect, Lord Norman Foster was hired to perform this work. His original design did not include a dome, but the Bundestag asked him to revise the roof design. He recreated the concept of a glass dome on the roof, using it as an environmentally friendly feature. The dome lets daylight into the plenary chamber, as well as providing natural ventilation. The light and ventilation are managed with louvered glass windows and a mirror system built into the dome. 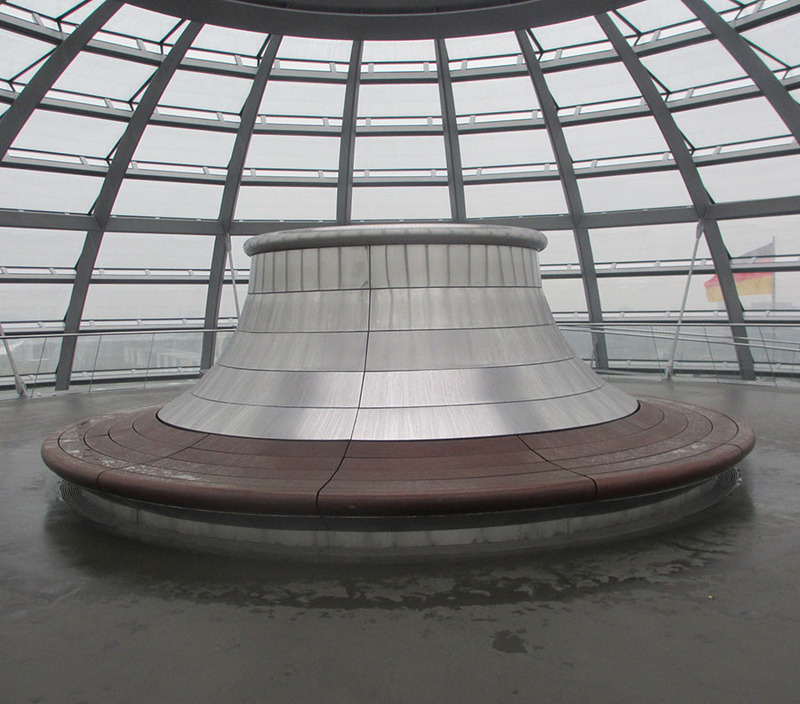 The top of the dome is open to the elements, and a spiraling walkway allows visitors to gradually ascend to the top of the dome while enjoying 360 degree vistas of Berlin. The Bundestag returned to Berlin in 1999. I visited the Reichstag in October 2015, on a grey, windy, rainy day. The rain came into the dome, creating a glistening floor. The photograph which we took illustrates the graphic nature of the dome. The windows were replicated using Caryl Bryer Fallert Gentry’s applipiecing technique. The vertical steel beams were stenciled onto the background using Tsukineko ink. 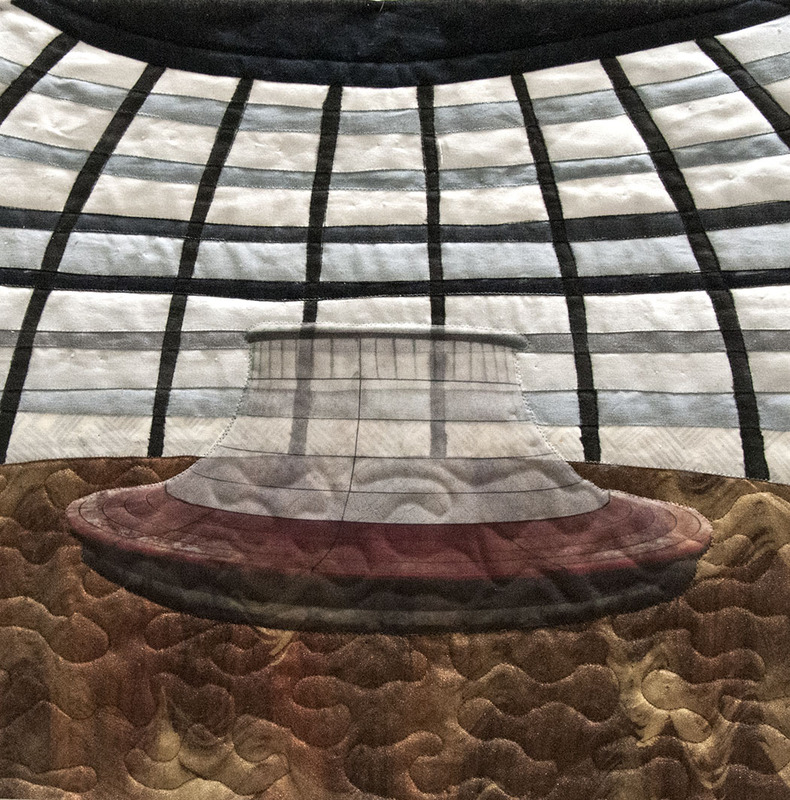 The central element which enables visitors to see the plenary chamber was isolated and printed onto silk organza. Materials: Commercially printed, hand dyed and hand painted cotton fabrics, Tsukineko ink, cotton batting, Invisifil, 100 wt silk, Monopoly and Aurifil threads. A very good choice Susan, I look forward to seeing your next quilt ! I love architecture theme! I look forward to seeing your series work! Like the others said Architecture is a very nice choice and you will have a lot of possibilities. Good choice Susan, I look forward to seeing further pieces. Your piece for “Architecture” is so strong — I look forward to seeing what your next piece looks like! Architecture and the way you talk about it and created your first piece, looks like a very good choice for your series. Love to see your next one. A dramatic first piece and plenty of further inspiration from your travels and photos for the creation of more. I agree. A great theme for your series.